You are going to be shocked when I tell you what I made this incredibly tasty monkey bread out of! I couldn’t believe it with my own eyes when I started to put everything together in the bundt pan. Once I tasted just a little sliver, my taste buds died and went to heaven. 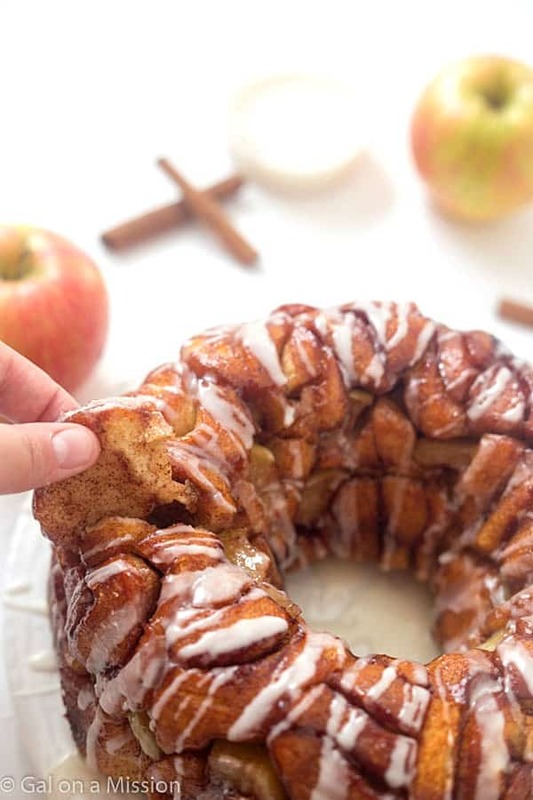 I am usually not the bold, pushy type, but you have to got to make this cinnamon apple harvest monkey bread. It screams bake me it’s the perfect fall dessert. Take a little closer peek at the above photo, you can see the cute little apple slices poking through. And may I say, they are taste wonderful – little bit of sugar, cinnamon, a hint of nutmeg is all those apples need. Can’t forget the incredible glaze that is already ready for you to pour when it’s hot out of the oven. Doesn’t you just want to grab a piece of your screen? Lucky me because I may or may not have a piece in my mouth. Now we are talking! See the little sliver that’s being pulled. You know you want it? Heck, I do, even though I am munching on some now. Each piece is dipped into a mixture of sugar, cinnamon, and nutmeg. Mmmmm is right! Surprise! 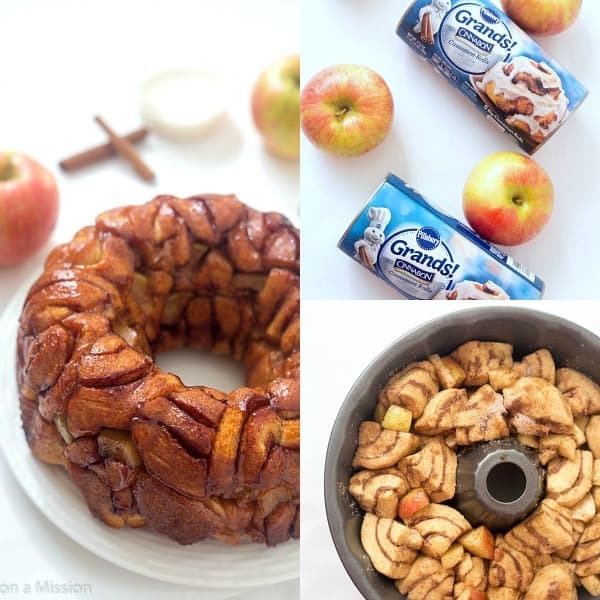 The secret and incredibly easy ingredient that is needed for this monkey bread is Pillsbury Grands! Cinnamon Rolls. I may have destroyed perfectly delicious looking cinnamon rolls and chopped them in half and then in half again. 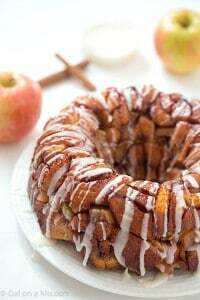 Dipped them into a cinnamon-sugar mixture and then packed them tight into a bundt pan with chopped honey crisp apples. And I am so glad I did it. So run to your local Walmart and pick up a few containers of Pillsbury Grands! Cinnamon Rolls! Preheat oven to 350 degrees. Grease a 9½ - 10" fluted cake pan. Set aside. Whisk together the granulated sugar, cinnamon, and nutmeg in a small bowl. Place ¼ cup of the mixture into a medium bowl with the diced apples. Stir until well combined. Slice each cinnamon roll in half and then in half again, you should have 4 pieces from one roll. Repeat until all cinnamon rolls are cut in half. Place each cinnamon roll piece into the remainder sugar, cinnamon, and nutmeg mixture. Then place the pieces into the bundt pan. Once there is one layer in the fluted cake pan, stuffed the apples into any places you can fit in the fluted cake pan. Repeat the steps above with the remainder cinnamon roll pieces. Pour the melted butter on top and bake for 30 minutes. 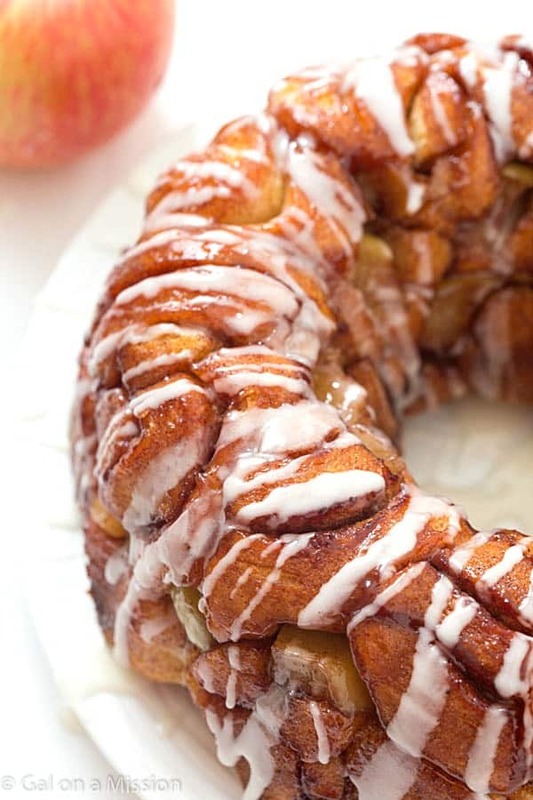 Allow the monkey bread to cool for 10 minutes, then remove from pan using a large plate.